Several months ago, writing about my path to the UWC, I shared my dream of helping the next generation of 16-18 year-olds from low socio-economic backgrounds to attend UWC’s. To that end, at the beginning of this year, I was involved in the selection of the student for the one full scholarship available. Out-reach activities leading up to the application deadline ensured government school graduates and students from low socio-economic background applied for the scholarship. The series of stages in the selection process, lasting several weeks, offering the scholarship to Iju and then raising the necessary funds to send her to Maastricht…all feels like a long time ago! Iju is already in the Netherlands! She reached the country last Thursday evening, and began her new life–an intense, some times exhausting and disorienting, and other times exhilarating, and still some other times a little overwhelming life. But, if I may say so, a totally and completely worthwhile experience, which, most likely, could change her life in ways she might have never imagined! Apart from taking care of the fund allocation and arrangement of fund transfer (see below for details), preparing Iju for her journey to Maastricht involved helping her and her family with shopping and making travel arrangements etc. The flight to Delhi was as expensive as quoted since they had to buy the ticket on really really short notice. The Dutch embassy informed the family of her interview appointment only the day before, which apparently is standard practice! The apparent discrepancy in amounts for items 4 and 5 is due to the fact that, firstly, straightforward conversion was made between the currencies, and secondly, the amounts were arrived at by converting between two of the three currencies. 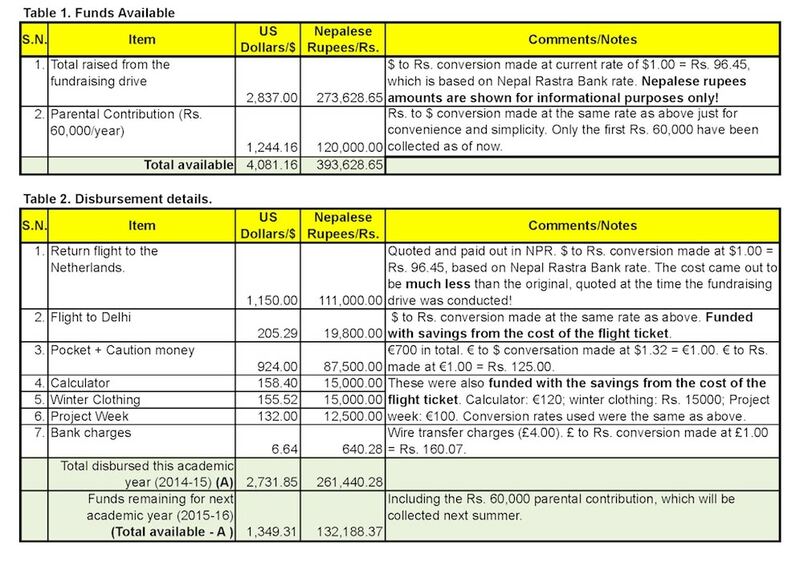 Whereas entries for item 4 was arrived at by converting Euros to both Rupees and Dollars, entries for item 5 was arrived at by converting Rupees to Dollars. Funds that she needs while in school have already been wired to the school, and arrangements have been made for their disbursement at appropriate times. Once again, thank you all for making all this possible for Iju!